When the Southern California fires started Sunday, Oct. 21, the nearest fire was in the hills of Ramona. About a 30-45 minute drive, it was seemingly far enough from my horse and me. Going to bed Sunday night, I wasn’t worried it would reach us anytime soon. Little did I know the adventure that awaited me and the rest of the county. I’m lucky enough to have a good friend with horse property in the Harmony Grove area of Escondido, a 30-minute drive from my condo in Oceanside. My retired Quarter Pony, Berry, lives there with his retired Thoroughbred buddy, Prez (short for Mr. President). Neither Prez’s owner nor I have a truck or trailer (unless you count my antique 1940 trailer, currently with no floor!). I’ve owned horses for 25 years and never had to evacuate, so to me an evacuation plan is kind of like a fire extinguisher—something you’re supposed to have but will probably never use. So my evacuation “plan” consisted of me handwalking the two out if need be (since Prez’s owner has emphysema). I also knew that when a fire breaks out in horse country, those with horse trailers usually come to help, so that was also part of my sketchy evacuation plan. 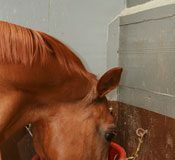 What I hadn’t thought about was how you connect with the people with horse trailers! When I woke up Monday morning, I discovered the fire had progressed to the other side of the hills from Harmony Grove. The wind had sent it rushing along, and although no evacuation order was given yet, Lali, who owns the property where Berry and Prez live, was rightfully worried. Searching for a way to mark our horses, (yet another hole in my preparation) my mom and I took the tags off her dogs and drove over. We haltered the horses, attached the tags, and fixed some blowing roofing material from the shelter. The normally blue sky was already gray; the sun a small dull ball, heavily veiled. The winds were strong; the air choked with ash. With no evacuation orders and the wind blowing south in our favor, Lali sent us home. But as we were driving, I noticed the flags blowing to the west. By the time we arrived at my mom’s house in Vista, Lali called to say they’d issued a mandatory evacuation. She didn’t know if they’d let us in by the time we drove back. What should she do with the horses? “I don’t know,” I said. “We’re on our way!” My mom drove as fast as she could through the surreal orange glow, while I sat with my cell phone to my ear, on hold with emergency animal services. With fires already threatening multiple areas throughout the county, it was impossible to get through to ask about help from those with horse trailers. We arrived and passed the fire marshal driving up the road announcing the evacuation over his loud speaker. 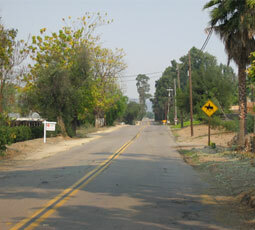 Country Club Drive, the road I took to hand-walk the horses out of the evacuation zone. The horses must have sensed my panicked state because neither wanted to follow me out of the pen! Once I got them moving, the adventure really began. I took Prez in my right hand and Berry in my left. My mom followed with her hazard lights on. It was a nightmare from the beginning. Cars, trucks, trailers and RVs were all trying to get out. One other horse owner was also leading his two horses out. Tumbleweeds, trashcans, branches and debris were blowing into the road, while gusts of wind slammed dirt and ash into our faces. Several times I felt like I’d be lifted off the ground, and I just shut my eyes and leaned into the wind. The horses were alternately either spooking in opposite directions or stepping on me. 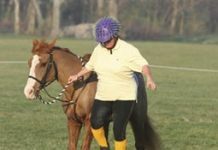 I focused only on two things: not letting go of either leadrope and moving forward. These were my goals throughout the three mile walk up Country Club Drive, which included crossing a bridge, a crossroad, going past a chicken ranch, a rock quarry, horse stables that were evacuating and more. The fire marshal passed us several times moving the evacuation order up the street as the fire started closing in. What an excellent first-hand account of what Micaela, Prez & Berry had to go through when the fires began last week. She wrote an excellent article about the “surrealness” of it all. I sure hope the wildfires never get really close to us.